Everything Just Sew: Freezer paper stenciling, oh yeah! I've wanted to have a go at freezer paper stenciling since I first saw it somewhere on the net. It looked just like something I would really enjoy, and really lent itself to the sort of embellishment I like to do. So when I realised that I could get freezer paper at Spotlight there was no stopping me! I won't bother with any sort of tutorial because blogland is full of them - I googled it and got over 10 000 hits! It's really easy and heaps of fun. I plan to do a lot more of this. After a couple of experiments I made pants for Nicholas. I wanted to photograph them flat on the floor to show the design, but as soon as he saw them Nicholas decided that he wanted to put them on. (He was really interested in the stenciled leg when it was on my desk). As it turned out, the resulting photo shows the design really well! 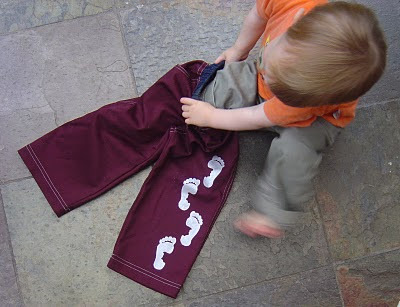 So here is my first stenciled garment - footprint pants for Nicholas. First - the pants look great and I love the stenci. Second - that picture is just too cute! Love it! Oh, cute! Doesn't it melt your heart when they love what you make them? very nice. great design. I too have seen freezer paper stencils all over the net but have never tracked down the actual paper. it looks fun! You know it's good when they want to wear two pairs of pants! That is a very cute pattern. What kind of paint did you use? 友誼是生活的調味品，亦是生活的止痛劑. . . . . . . . . . . . . . . . . . . . . . . . . . . . . . . . . . . . . . . . . . . . . . . . . . . . . . . . . . . . . . . . . . . . . .